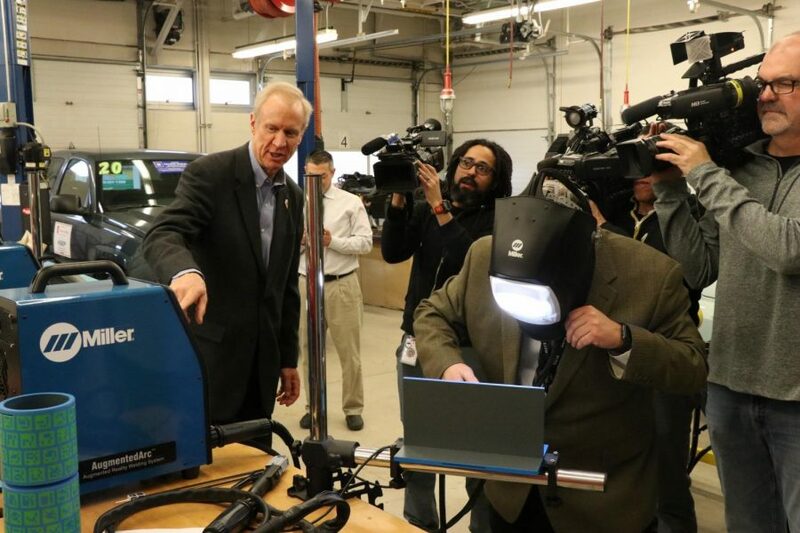 Governor Rauner being shown how Niles West uses virtual welding to prepare students for future career paths. Illinois governor Bruce Rauner visited Niles West on Mon., Jan. 22 to tour the school’s NSERVE facilities. NSERVE (Northern Suburbs Educational Region Vocational Education), which services Niles Township, Evanston Township, New Trier High School, Maine Township, and Glenbrook High Schools, is a program that seeks to teach students real-world career skills in a classroom environment. NSERVE has an expansive program at Niles West, which is in part why Rauner chose to visit. It is Rauner’s hope that the NSERVE program at Niles West can serve as a model for other districts. “It’s all about sharing resources and learning from each other. What I want to do is have other schools learn from what you’re doing here and then see how we can get the resources so these types of classroom experiences can be offered at other schools,” he said. Rauner entered the school through the Oakton lobby before greeting school administrators, including principal Jason Ness, assistant principal of operations Mark Rigby, and superintendent Steven Isoye. Following that, Rauner was taken to the principal’s conference room for a short presentation before commencing his tour of the school facilities that house NSERVE programs. The first stop on the tour was to an Introduction to Engineering Course, where Rauner spoke to students, one of whom was freshman Angelina Boudouvas. Rauner then stopped by a Computer Science class to meet members of the award-winning VEX Robotics Club and witness the team’s robots in action. “I was impressed by Governor Rauner’s genuine interest in our school’s robotics club, going so far as to question specific design considerations and time constraints on our projects,” senior and VEX club member Robert Majcher said. Tim Sullivan, computer science teacher and VEX sponsor, was also excited to have Rauner witness the hard work of the robotics students. District 219 superintendent Steven Isoye is proud of the opportunities offered by the school that were being demonstrated by Rauner’s visit. As for his message to Niles West students, Rauner wants to make sure that everyone has the opportunities they are looking for within the state of Illinois. I really wish students had more of a heads-up about his arrival so we could have organized a protest of sorts. This guy has done damage to public education in Illinois, and he should be ashamed to show his face at our school. Also,does he know that a doctor and a physician are the same thing? Nice seeing the all the liberals in the comment section ripping on the guy for coming to our school. The guy is up for reelection and could easily be out campaigning. He chose to visit Niles West and regardless if you like the guy or not you should respect him. At least Bruce Rauner fights for the people and did not increase taxes, unlike the democratic controlled state legislature. If only people knew it’s Michael Madigan who’s ruining this state.